Looking for the updated Instagram statistics for 2019? In this article, I’ve researched and brought to you the latest and the greatest Instagram statistics for 2019 that ranges from Instagram user demographics, Instagram likes stats and stats about Instagram for business. Feel free to use them in your own articles, papers or social media updates. Led by the two most successful app founders in the history, Instagram has seen tremendous success in the social media industry. How old is Instagram? How long has Instagram been around? From turning down a job offer from Zuckerberg himself, in 2014, to closing one of the beefiest deal with the same Facebook founder (for a jaw-dropping $1billion); Instagram CEO Kevin Systrom has had quite a ride. This deal also proved Mark Zuckerberg’s keen insight into the business potential of an app that hadn’t made a single penny in revenue at the time he bought it for $1billion. This research article on latest Instagram marketing statistics dives deep into the Instagram usage stats, user demographics and business facts about Instagram. 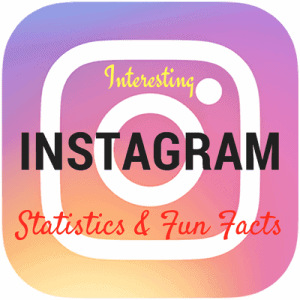 Ready for some new and exciting Instagram fun facts and research data? 1) How many people use Instagram in Total? On June 2018, Instagram reported a landmark. Instagram now has over 1 billion monthly active users. This grew from 800 million MAU in September, 2017. Instagram is growing steadily and is soon expected to cross 2 billion active users by 2023. 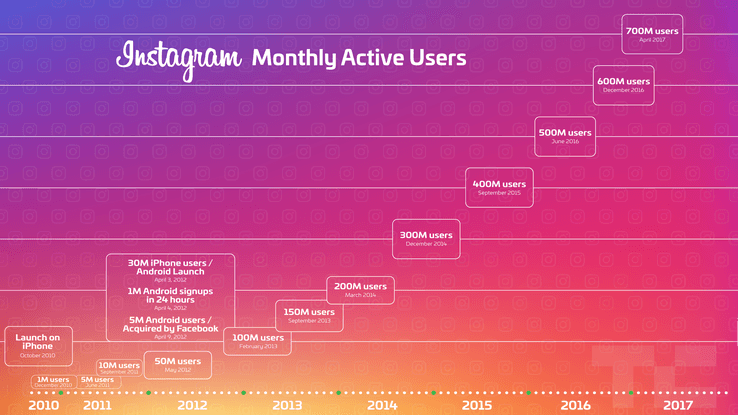 Below is a graph by our friends at TechCrunch which shows the growth curve of Instagram user acquisition over time. Needless to say, this Instagram growth case study proves just one thing, the whole success of a startup/business lies in one thing, giving a feeling of community to the users. How many users are on Instagram? As per Instagram’s official report, there are over 1 billion users on Instagram. 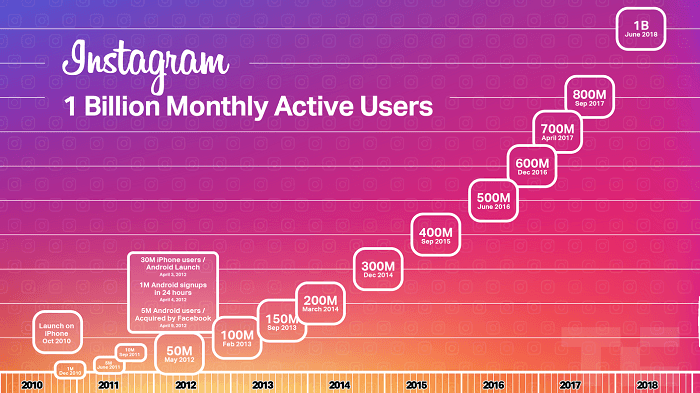 2) Instagram, with 1 billion people who use Instagram per month, has surpassed to become twice of what Twitter has in terms of monthly active users (MoA). Instagram has a whopping 500 million daily active users who use Instagram daily. 4) What percentage of Internet users are on Instagram? 20% of all internet users are on Instagram. 5) What percentage of US users use Instagram? 20% of all US users use Instagram. What is the most popular social networking platform amongst teens?According to a recent survey by Piper Jaffray, Instagram is the most popular social media platform/app amongst teens. Instagram is the only platform that surpasses Snapchat and shows a progressive growth (with Facebook and Twitter declining). 6) How many photos are shared on Instagram each day? Over 80 million users photos are uploaded to Instagram each day. 7) What is the time spent by an average user on Instagram? Time spent on Instagram has seen a rise all thanks to the launch of stories. Users under 25, now spend up to 32 minutes a day on Instagram, on average, while those 25 and above spend more than 24 minutes per day. In another email by SimilarWeb to TechCrunch, the former revealed that the average Instagram users have gone from spending 29 minutes per day on the app to up to 55 minutes per day. 8) Who has the highest engagement on their Instagram posts? According to research, celebrities get far more engagement on Instagram than other content providers like media houses, journals, etc. 9) What percentage of your Instagram feed do you miss generally? After the Instagram algorithm change, Instagram says over 70% of your feed gets unseen due to the huge amount of usage and data uploaded. 10) What percentage of Instagram users are from outside the US? 80% of all Instagram users consist of non-US users. 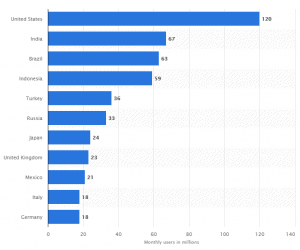 As is pretty clear, USA is the country with highest number of Instagram users in 2019 followed by India and Brazil. 11) What percent of Instagram content are photos? Photos make over 91.07% of all Instagram updates. 12) Which is the first photo shared or uploaded to Instagram and when? The first ever photo uploaded to Instagram by Instagram co-founder Kevin Systrom on 16th July, 2010. 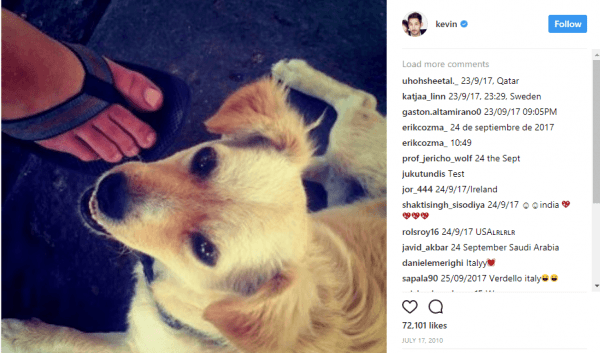 This first image uploaded to Instagram (then called Codename) was of Kevin’s dog and was taken near a Taco stand. This was exactly 3 months before Instagram was released to the public. The first ever photo uploaded to Instagram. 13) How many fake accounts are there on Instagram? Over 8% reported fake Instagram accounts by spam bots. 14) What positive effect does video has over other content formats on Instagram? Video content is viewed 5x longer than other static content formats on Instagram. 15) How many “likes” does Instagram users give per day? Instagram gets a total of 4.2 billion likes per day on its posts from users all around the world. 16) How many online users use Instagram? 6 out of 10 online users use Instagram or have an active Instagram profile. 17) What is the ratio of males to female users on Instagram? Female vs male on Instagram is 36% vs 24%. 18) Who is the top most followed Instagram user in 2019? Christiano Ronaldo is the most followed Instagram users with the highest number of Instagram followers (145m) on Instagram. Selena Gomez is now the second most followed Instagram user close behind Christiano with 144m followers. When are Instagram users most active? A research by Later.com reveals that Instagram users are most active during lunch time (11am-1pm) and in the evenings (7pm-9pm). What is the most used Instagram filter? As per Canva.com’s research, the most used Instagram filter is Clarendon. The second most popular filter on Instagram is Ghingham. 20) Which is the most used emoji on Instagram? Most used emoji on Instagram is the red heart <3, which is shared 79% more than the next most popular Instagram emoji, a smiling face with heart eyes. 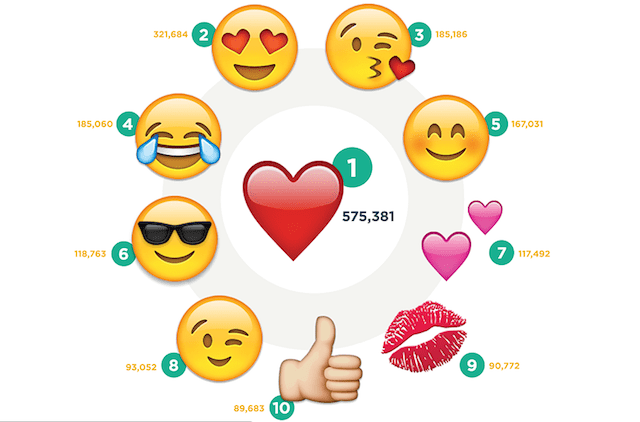 Here is a list of top 10 most used emojis on Instagram. 21) What are the most popular food items shared on Instagram? Pizza tops the list with most hashtagged food on Instagram with over 19,701,393 posts about it, followed by Sushi and chicken in the second and third spot of most popular foods on Instagram stats, respectively. 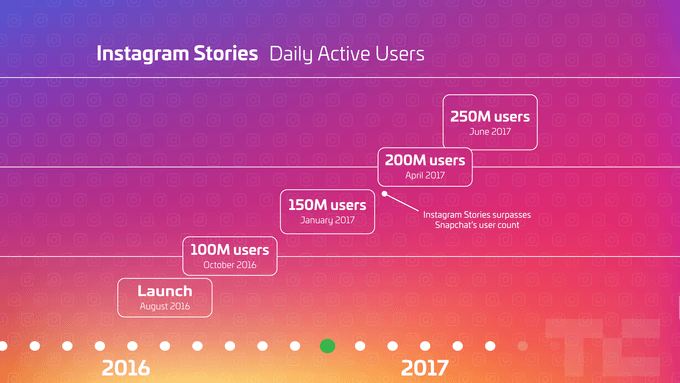 With over 250 million active users in just a year of its launch, Instagram’s stories feature has been killing it with its popularity both for users and businesses. The success of stories feature has made Facebook add the stories feature to all it’s platforms including messenger, WhatsApp, & Facebook itself. One of the key features that has catalyzed this growth is the ability to share live videos to your stories for 24 hours before they disappear forever. Below are some important statistics regarding the usage of Instagram stories (source). 22) How many Instagram users use Instagram stories feature? Instagram stories have 150 million active users just within the first anniversary. 23) How many Instagram Daily Active Users does Instagram have? 24) What are the top location tags used in Instagram Stories? 25) What are the most popular face filters used by Instagram stories users? 26) What are the most popular stickers on Instagram Stories? 27) What are the top used hashtags for Instagram stories in 2019? Below are the best hashtags that are highest used on Instagram stories. I hope you can use them in your own Instagram marketing campaigns to get more exposure and visibility. Point to note here is India, which is the second largest user base for Instagram, isn’t in the top 5 countries that send desktop traffic to Instagram.com. These results are only for desktop traffic, app traffic/usage is something not taken into account. 28) How many users have a business profile on Instagram? Instagram revealed it has a whopping 15 million registered business accounts on the platform. 29) How are business profiles using the Instagram stories feature? Businesses on Instagram are actively using Instagram stories. For example, over 50% of business users created an Instagram story in July 2017. 30) How effective is Instagram Stories feature for businesses on Instagram? As for the conversions of Instagram Stories, reports say, one in every 5 organic stories gets a direct message. 31) What is the economic profile of Instagram users? Instagram users are 25% more likely than average internet users to be in the top income quartile. 32) How many followers on average does a brand on Instagram has? The average number of followers for a brand on Instagram is 1 million. 33) How many users advertise on Instagram? Instagram now has 1 million monthly active advertisers who use sponsored ads to reach more people on Instagram. 34) How many active accounts can you have on Instagram? You can have up top 5 legit active accounts on Instagram. 35) What is the maximum duration of an Instagram video (Instagram video length)? Instagram video length can be anywhere between 3 seconds to 60 seconds. 36) How many people can you follow on Instagram? You can have a maximum number of 7500 Instagram followers via one profile. 37) What percentage of Instagram’s revenue (income) comes from the US alone? The US alone contributes to a mind-blowing 85% of Instagram’s total ad revenue. 38) Some more Instagram statistics about brands on Instagram? According to Instagram, 50% of all Instagram users follow at least one brand on the platform, and 60% of users say they find Instagram as a platform to learn about a business or brand or product. 39) Who owns the record of most watched Instagram stories in the US? The most watched Instagram stories in the US belong to J Balvin, The Fat Jewish & Lele Pons. What Is Instagram’s Market Valuation In 2019? Bloomberg estimates Instagram is now worth $100 billion which is a 100x ROI for the app being bought by Facebook for less than $1 billion in 2012. 40) What percent of Instagram ads are videos? 25% of Instagram ads are videos. 41) What are some interesting Instagram video stats? When videos were first launched on Instagram (2013) over 5 million videos were uploaded in the first 24 hours. Top brands are producing 90-100% more videos on Instagram. For example, Time magazine posted 68 videos in May 2017 (in posted only 6 during the same month in 2016). Instagram videos vs. Instagram photos: Instagram videos (sponsored) drive more engagement than Instagram photos (sponsored). Videos receive 3x more comments than photos. 42) How many users leverage Instagram Direct feature per month? Over 375 million monthly active users use Instagram’s direct feature. 43) How many people can I add to a group message in Instagram Direct? You can add a maximum of 32 people in a group message using Instagram Direct. It’s been seven years since Instagram’s first debut, and it has already created a wave in visual storytelling. The photo-sharing app has created new business opportunities, helped people show their creativity and also crushed rival businesses by copycat(ing) their most famous features (Oh Snap!). I hope these statistics will help you understand Instagram better, see how you can leverage the platform better for getting new Instagram followers, leads and business opportunities. These Instagram facts and statistics have been complied by attentive and careful research through various platforms, news journals, media reports and Instagram’s (and Facebook’s) press releases. Most of the Instagram stats are from official sources. However, some are collected from reputable news sources like the Tech Crunch. I did my best to gather the latest and the most authentic data. However, I cannot guarantee 100% accuracy. I am not liable for any consequences, whatsoever, by the use of these facts. 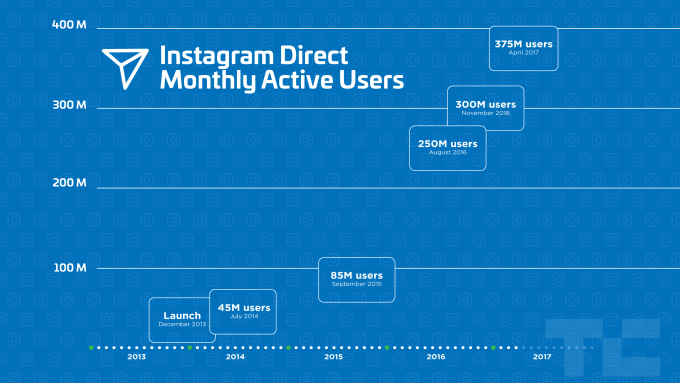 Instagram active users chart & chart showing Instagram’s Instagram’s Direct feature. P.S. I update this page regularly and whenever I get new Instagram facts and stats, so make sure you bookmark this page and visit in the future for updated info about Instagram. This is a very complete list of stadistics for Instagram! !